Are You Embarrassed About Your Drawers? Every home has a messy drawer or two you try to hide from company. 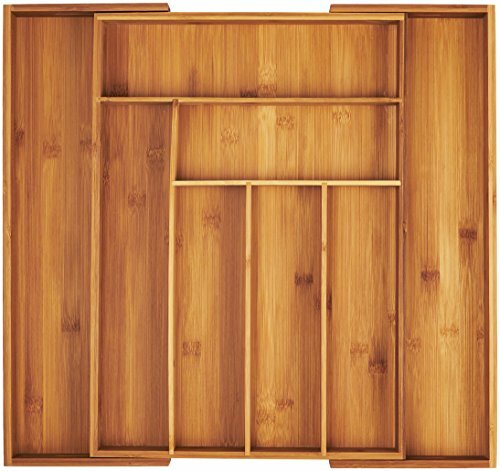 This elegant and durable bamboo drawer organizer makes you proud to open your drawers wide again. Whether it's keeping your silverware and cutlery looking fresh, keeping your tools or crafts organized, or preventing your thumbtacks from spilling over onto your paper clips, this organizer effortlessly expands to fit it all. Adjusts To Fit Drawers Of Varying Sizes The generous dimensions ensure that every standard-sized drawer is fitted snugly for that custom made look. When compact, the insert measures 12.75" and has 6 compartments. Fully expanded, it measures 17.5" and has 8 separate compartments Natural Bamboo Is Durable, Elegant And Earth-Friendly Eco-friendly and practical meets gorgeous and strong. As one of the world's fastest growing plants, bamboo is one of the most sustainable materials on the planet (which is a bonus, because it looks great and is amazingly strong too). If it gets dirty, give it a quick swipe with soap and water. If you're feeling fancy, rub a little cutting board oil on it and it will shine right up for you >OUR 100% 2-Year "ORGANIZER'S DREAM" Money-Back Guarantee Like all Bellemain products, the Bellemain drawer insert isn't just another pretty face. It's hard wearing, long lasting materials will stand up to anything you throw at it, or in it. So go ahead, do your worst, and if you find our drawer insert to act anything less than exemplary, return it for a full refund. *Supplies are limited. Secure your order now to ensure availability. Order Your Bamboo Organizer Today By Scrolling Up And Clicking "Add To Cart" Now! FULLY MATURED BAMBOO IS INCREDIBLY STRONG: Unlike other manufacturers, our bamboo organizers are harvested at full maturity to increase durability and strength. For you, that means this Bellemain organizer might just last longer than your drawer. NO MEASURING NEEDED | SPECIALLY CRAFTED TO FIT ANYWHERE: Our drawer insert is generously proportioned through expert craftsmanship. 18 from top to bottom, the width expands from 12.75 inches (6 compartments) to 19 inches (8 compartments). Fits most drawers snugly, while providing an attractive, upscale custom look. MOSO BAMBOO | BEAUTIFUL AND SUSTAINABLE: Moso bamboo is naturally more uniform in color than cheaper strains. It cleans up easily with soap and water, and is harvested using sustainable methods. MAKE THE MOST OF WHAT YOU HAVE: Maximize your available storage space in standard-sized drawers so not an inch is wasted. Nothing gets lost, and you see everything at a glance. WE PROVIDE THE BEST BUY-BACK GUARANTEE IN THE BUSINESS: We are certain you will enjoy your premium Bellemain organizer for years to come. However, everybody makes mistakes. And if you think we made one, or you no longer feel it's right for you for any reason, we'll buy it back from you risk-free. It's all-purpose on purpose, so don't over-think it - if you need some help hauling, bailing, cleaning, or whatever-else-ing, turn to the LoadOut Bucket. Wherever we're getting our hands dirty, we need tools that don't fail when the job gets tough. 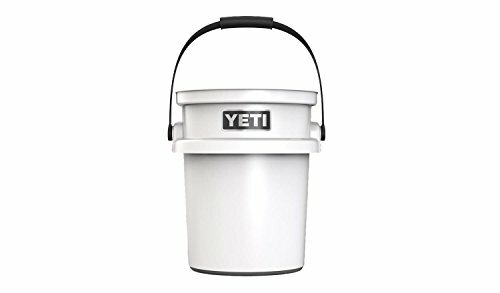 And the YETI LoadOut Bucket is ready to get to work. It's built for washing down the boat, lugging feed on the ranch, picking up spent shells in the duck blind, or whatever else you've gotta tackle. Versatile, easily stowed, and over-engineered to last, the LoadOut Bucket can be hauled anywhere to do nearly anything. It's just as handy as a bait bucket as it is storing kindling for the campfire. It's also food-safe in case you need to keep a whole spit-ton of sunflower seeds handy, for example. Are you tired of messy, unorganized, and overflowing kitchen drawers? Our Farmhouse kitchen utensil holders timeless design adds elegance to any countertop This metal utensil crock offers a deep compartment and a chic rustic design in a neutral color suitable for any size kitchen Our enameled steel crock won t break like those made of ceramic, stoneware, concrete, marble, wood, bamboo, mason jars, or porcelain. We are so confident that you will love our Home Acre Designs Kitchen Utensil Caddy that we offer a zero-risk buying experience! If at any point after buying your Kitchen Utensil Crock, feel absolutely free to make a no-questions-asked return for your money back. 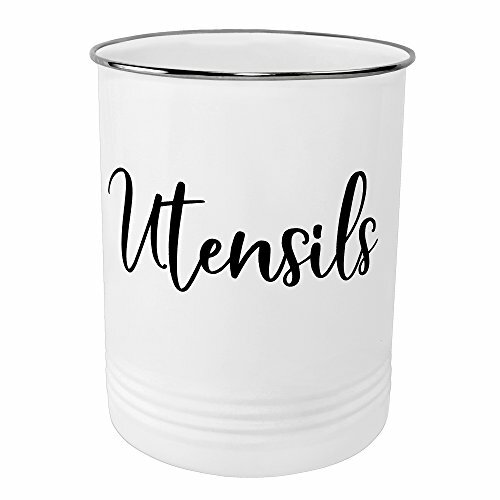 ORGANIZE YOUR KITCHEN-Home Acre Designs White Utensil Holder is perfect for your large utensils, tools, cookware, wooden spoons, whisks, ladles, tongs, spatulas, flatware, and gadgets. Save space in your drawers with this handy wide mouth bucket. 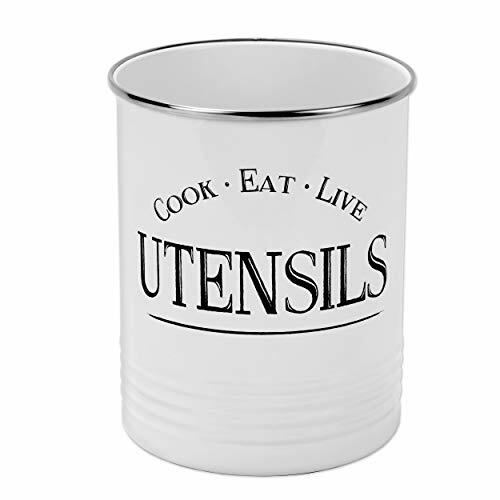 ADD FUNCTIONALITY TO YOUR KITCHEN - Organize your utensil drawer and kitchenware with this Retro Inspired Beautiful Caddy with a stylish stainless steel rim. 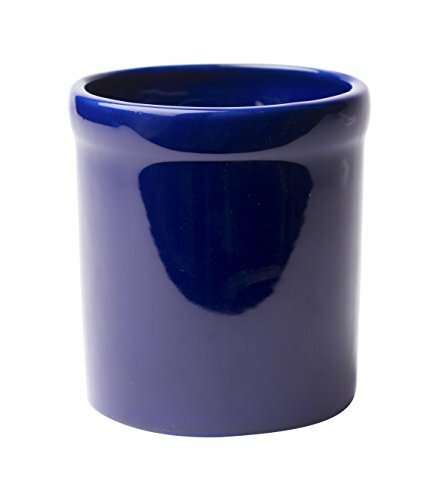 Our timeless and sturdy utensil crock is the ideal size and great for large handled tools. THE HOME ACRE DESIGNS PROMISE - Your Kitchen Utensil Holder comes with a lifetime peace of mind replacement against defects guaranteed. 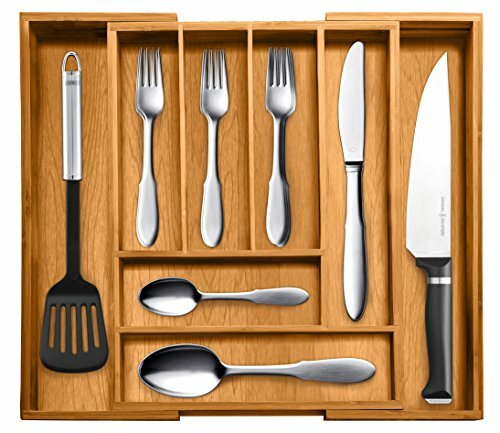 If you are not 100% satisfied with your purchase, we will buy our Utensil Holder back from you, free of charge! SO, WHAT ARE YOU WAITING FOR? - Click the 'Add To Cart' button now to get your Home Acre Designs Kitchen Utensil Holder in as little as two days! Organize, simplify and beautify with this high quality ceramic cooking utensils holder! Stylish and functional kitchen design is about accessorizing with appropriate d cor, which is how the Owl Utensil Holder by Comfify excels. It organizes and simplifies your kitchen in a way that brings style and comfort to the room. What's your kitchen style? The Owl Utensil Holder by Comfify fits anywhere, including traditional, vintage, shabby chic and modern looks. This ceramic cookware organizer, in a delightful shade of aqua blue, will make your kitchen truly feel like home. It's not just about great looks, it's also about quality and craftsmanship. The Owl Utensil Holder by Comfify is made from chip- and fade-resistant high quality ceramic. Shopping for someone who loves cooking and working in the kitchen? The Owl Utensil Holder by Comfify is the kind of gift that will make you look good for giving it. This cooking utensils organizer is attractive, functional and affordable it makes a wonderful gift for birthdays, anniversaries, as a wedding gift or housewarming present, and much more. 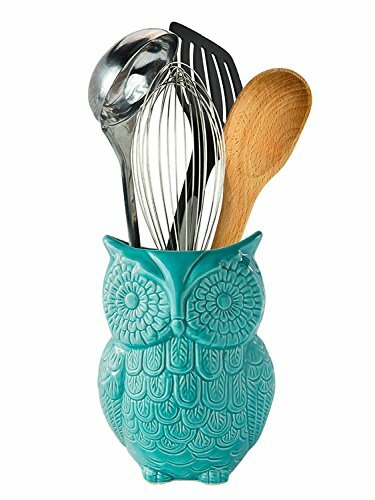 CLICK NOW TO PURCHASE and make this charming owl utensil holder a treasured part of your kitchen. Purchase protection provided by Amazon's A-to-z Guarantee, and Amazon Prime members receive 2-day shipping ABSOLUTELY FREE! Walford Home Farmhouse Utensil Holder Premium Quality Price Are you tired of messy, unorganized, and overflowing kitchen drawers? Our Farmhouse kitchen utensil holders timeless design adds elegance to any countertop This metal utensil crock offers a deep compartment and a chic rustic design in a neutral color suitable for any size kitchen Our enameled steel crock won't break like those made of ceramic, stoneware, concrete, marble, wood, bamboo, mason jars, or porcelain. PACKAGE INCLUDES: Our white kitchen tool caddy made of durable galvanized steel with a stainless-steel rim to bring that American farmhouse style to your kitchen decorations Our vintage kitchen organizer comes in a stylish box, making it the perfect gift FEATURES AND BENEFITS: Countertop solution for storing all your accessories Canister is perfect for storing cooking utensils and your basting brush Quality - Made with food safe, high quality, easy to clean, and rust resistant materials Stylish stainless-steel rim Durable with a weighted bottom Perfect for your large and small utensils 100% SATISFACTION GUARANTEED We are so confident that you will love our Home Acre Designs Kitchen Utensil Caddy that we offer a zero-risk buying experience! If at any point after buying your Kitchen Utensil Crock, feel absolutely free to make a no-questions-asked return for your money back. SO, WHAT ARE YOU WAITING FOR? Click the "Add To Cart" button now!